The technology was once the province of Sony, which started developing it several years ago, only for it to disappear from the radar when the company shifted its research to the newly formed Field Emission Technologies. This latter company resurfaced at CEATEC with several prototype 20in FED displays to show for its efforts. While it’s unclear if FED will ever take off, especially in the face of so much competition from other technologies, its attributes appear compelling. 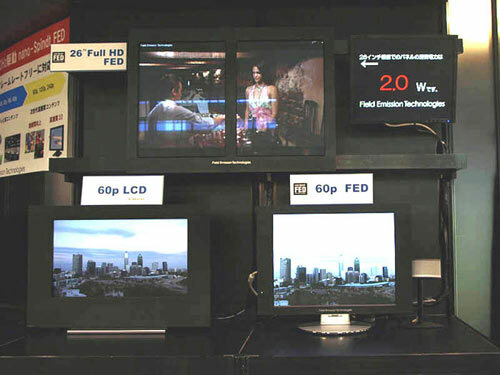 According to Field Emission Technologies, FED screens produce better colors, sharper images and have far higher refresh rates than LCD and plasma displays. Surprisingly, FED’s prowess is based on methods very similar to the cathode ray tubes (CRT) used in old TV sets, in that electrons trigger the individual pixels to light up. The difference is that CRT sets use an electron gun to scatter the charged particles, whereas each FED pixel has its own corresponding electron source. Accordingly, FED displays require no backlight and can be made thin and light and - most appealingly - cheaply. Field Emission Technologies hopes to have FED TVs of up to 32in on sale within two years.